Why is G pronounced the way it is in Dutch? - Harold Tor. Why is G pronounced the way it is in Dutch? It has puzzled me for a long time, why the G sound is so different in Dutch, compared to the way it is pronounced in the languages around it, like English, French and German. While others are contented to just accept it as it is, I set out to discover the evolution of the G sound in Dutch. How is ‘G’ pronounced in Modern Dutch? Has the ‘G’ sound undergone any changes in the evolution of the language? If so, why has the ‘G’ sound changed and why have these changes affected only Dutch and not the nearby languages? If these changes have really occurred, when did it take happen? This is known as the ‘soft G’ or ‘zachte G‘ /x/ in Dutch  which is a voiceless velar fricative, as opposed to the ‘hard G’ /ɣ/ spoken in the north, which is a voiced velar fricative. The soft <g> is used on television and radio and in formal speech. Is it the ‘Big House’, the ‘Goth House’ or the ‘Red House’? Like the <g> sound, the <r> is pronounced differently in different regions: you have the Flemish r, the Gooise r, the Limburg r, the Rotterdam r etc . But in big metropolis like Amsterdam, Brussels and former French-speaking cities like Ghent and Leuven, the “more prestigious, French” r /ʁ/ has taken root , as opposed to the “traditional” rhotic r /r/ spoken in West Flanders. No matter how <g> is pronounced in Modern Dutch, it is clear that the sound is not a velar stop /g/, like in English and German. Could there have been a similar development that happened in the past, that might explain this curious feature? As you know, Dutch used to be known as Nederduits. The modern-day name Nederlands is only 200 years old and was invented for the national identity of the new kingdom of the Netherlands. Its old name and its name in English aptly describe its place in the West Germanic branch of Indo-European languages. It is the westernmost language that is part of the dialect continuum that stretches east across the north of Germany. The continuum denotes the Low German language and its border is marked by the Benrath Line . South of the line is High German, from which Modern High German is derived. Dutch is also the direct descendant of Low Franconian. Low Franconian was spoken by Frankish tribes that crossed the Rhine into the Roman Empire in the 4th century. They were also the ones who conquered France in 496 and gave it its name. The Franks are also the ancestors of all Dutch-speaking people in Belgium and the Netherlands. The West Germanic languages (except English) experienced what linguists call the High German consonant shift in the first millennium AD. By the time that we have written records of the languages affected, the changes have already been complete. Thus all of the changes are derived from comparing written records and current differences between the different languages. Certain shifts concern only High German (/p/ > /ff/), while other are consistent throughout West Germanic (/θ/ > /d/) . But the velar stop /k/ did not become a velar fricative /x/ sound directly. Interestingly, this mirrors the current state of <g> in Dutch, where a velar stop is pronounced either as a glottal fricative /h/ in West Flanders or velar fricatives /x/ and /ɣ/ in other places. This softening is complete only for one of the velar stops <k>. There is still the <g> sound. just like in ‘ziemlich‘ /tsimlɪç/ or ‘königlich‘ /khønɪklɪç/ . This weakening of the <g> sound gets more and more frequent as one travels northwards, so much that whenever a word ends with <g> it is pronounced as the velar fricative /x/: Weg, Berg, genug. This weakening could be due to the fact that the <g> is part of an unaccented syllable. Another example of this weakening is in the prefix <ge->. How does this show that the <g> sound the Dutch went from /g/ to /ɣ/ and not the other way round? Like how the <k> sound weakened into <h> and <ch> during the High German consonant shift, the <g> sound in Low Franconian and related languages also weakened in the similar manner like how it is starting to do in High German’s <-ig> suffix. I am postulating that this weakening is so widespread that it affected not only Old Dutch ONL, but also Old English OE. Some linguists claim that the Dutch retained the West Germanic pronunciation of <g> /ɣ/, and it is during that High German consonant shift that it shifted into /g/ . I argue the opposite: <g> was originally pronounced as /g/ but it weakened into /ɣ/ and /x/ in Dutch. Interestingly, the same word in Afrikaans is spelled ‘springhaan‘ and pronounced with a /k/. This shows that the pronunciation of /g/ or /k/ in Low Franconian lingered on in these few words in Modern Dutch. These examples show that the <g> in Dutch and Low German used to be pronounced as velar stop /k/ and not as velar frivatives /ɣ/ and /x/ or glottal fricatives /ɦ/ and /h/ as is in the case today. The second evidence I want to provide is the closest living relative to Dutch, which is English. There are reasons to believe, that English underwent the sort of weakening of velar stops of both <k> and <g>, and that for the case of <g>, it first went through a lenition process  when it turned into /x/, /ɣ/ or /h/ before transiting to a <y>. Old English had similar pronunciation to Low Franconian. If like what certain linguists say that all g used to be pronounced as /ɣ/: Why did the <g> in words like ‘good’ or ‘great’ not turn into <y> as well? For a <g> sound to turn into <y>, it probably went through the transition of /h/ or /ɣ/. The Old English word is ‘genóg‘, cognate to Dutch ‘genoeg‘ and High German ‘genug‘. The fact that it is now spelled with <-gh> tells us that it must have been pronounced as a /ɣ/ or /x/, like in ‘night‘ and ‘light‘, a pronunciation that has disappeared in Modern English. So Old English ‘genóg‘ must have been pronounced as /xənox/. Taken into account the weakening of the ge- prefix in modern Low German, the ge- further contracted into <e->/jə/. 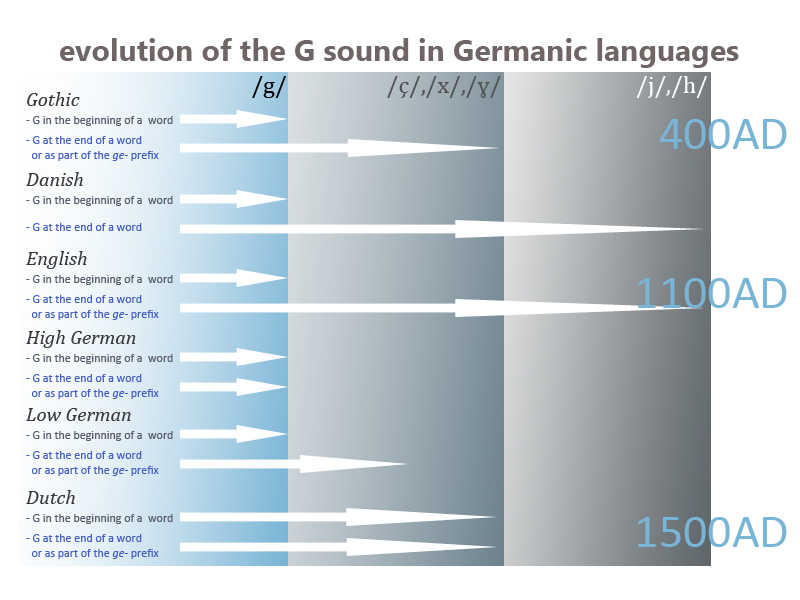 Another factor I want to present as evidence is the pronunciation of the <g> sound in other Germanic languages. Although the Goths and the Franks (ancestors of modern day Dutch-speakers) were different tribes, their languages were both directly derived from Proto-Germanic. In Gothic, <g> is pronounced as a hard /g/, in the beginning of a word, like in ‘girl‘ (ModE). Funny enough, this feature is retained in Modern Danish. When the <g> is in the beginning of a word, it is a hard /g/ sound. So in ag, eg, ig, øg, og, all of the g is pronounced /y/ or /h/. This is because it has weakened from /g/ to /x/ or /ɣ/ (during Gothic era) and into /h/ or /j/ in recent times. This same evolution happened in Old English more than a thousand years ago. But more importantly, it demonstrates that the <g> sound was hard in Proto-Germanic (still the case in High German), but it softens to /x/ or /ɣ/ (which is still the case in Dutch), and it became a /y/ or a /h/ in Old English, Modern Danish and Swedish. Words ending with g in ONL have consistently evolved to be written with ch in EMNL. This means that the g has softened and pronounced as a /ç/. Like in Gothic, High German and English, the velar stop is still being pronounced in EMNL, because we can telling from the spelling that it is NOT written as a ch or a gh: gaen, goet, groot. Past participles with the ge- prefix is written ghe- in EMNL. Some linguists think that this is a mere spelling convention that quickly ran out of fashion in MNL. But we can say for certain it is not a velar stop /g/ , otherwise it would have been spelled simply with a g. This is especially telling in the EMNL word ghegaen, which would have been pronounced /ɣə-gan/. Because the spelling harmonised to a single g like in Modern Dutch by 1500AD, we can safely say that the weakening of the Dutch velar stop /g/ was complete by then. This implies that the velar stop /g/ in words like goed, gaan, or groot, still pronounced in the 12th century, have disappeared by the 16th century. The way <g> is pronounced today in Dutch is part of the process of the weakening of the velar stops in Germanic languages. Contrary to the theory proposed by certain linguists that the Dutch <g> is the remnant feature of Proto-Germanic, the above evidence show that <g> was /g/ originally and is still the case in Modern High German. With the transcribing of languages in words, the evolution of the <g> sound is captured or frozen in time for different languages. What has happened in Dutch, is that the velar stop <g> has weakened at the end of a word, and that weakened <g> is generalised throughout the language in the modern era, such as all g’s are now /x/ or /ɣ/ . 5. van der Wal, Marijke. “Geschiedenis van het Nederlands Utrecht, 2004, p.413-414.